If you are looking for free software for filing your taxes, you now have a choice to make. StudioTax is once again available for the 2009 tax year and in my limited test drive of the 2009 edition, I found it to have the same high quality and ease-of-use that I noted in my original review. But UDoTaxes, which is also free to download and free to print and file or NETFILE offers an equally good alternative. Just like StudioTax, the developers behind UDoTaxes ask for nothing more than a voluntary contribution via PayPal to support their efforts. UDoTaxes supports the direct entry method of preparing taxes and though the software has a list of interview questions, the interview method is fairly basic. I downloaded and installed UDoTaxes on my Windows Vista laptop and when I ran the software for the first time, it prompted for the usual information such as name, SIN number, Mailing address etc. and created the tax returns for the taxpayer and spouse. The software looks pleasing and follows the typical pattern of listing the summary and forms navigation on the left-hand pane and clickable CRA tax forms on the right-hand pane. 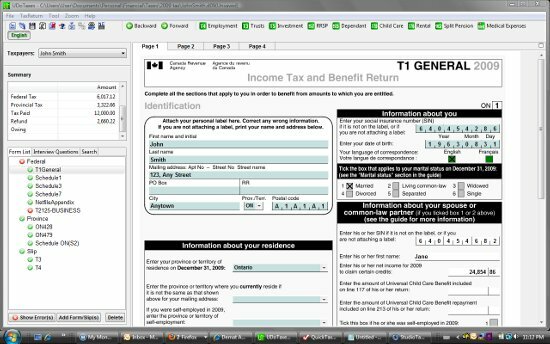 You can enter tax data through the T-slips, which look exactly like the ones you receive in the mail. The T-slip screens can be accessed either through the toolbar icons or from the form list or by clicking the corresponding box in the T1 General screen. UDoTaxes has some clever touches. Clicking on a box in the T1 General lists the related forms, which allows you to select the one you want to work with. If a form is incomplete, it is prefixed with an “x” button the forms panel. A RRSP Optimizer and a Pension Split Optimizer are built into the tool. In my opinion, UDoTaxes looks just a bit more polished and a little bit more responsive than StudioTax but both products are extremely good and the price is right. Sounds like it’s worth a shot too. If I had unlimited time I would try this one, and a host of others, including Tax Chopper. @gene: I was hoping to do my taxes with a bunch of software and write about my experience but it is turning out to be far too much work. If I didn’t write the blog, I don’t know if I would be motivated to check out tax software. It’s not exactly fun. To date, I have not used tax software to file my taxes but UDo seems like a pretty good option if I decide to go the online route. I like the fact that it’s free and all they ask is for you to contribute a reasonable amount to the cause. Maybe I’ll give tax software a shot next year. Just filed using UDO. very user friendly….not sure if the files created are PDF or ???. With their inclusion of the net file appendix, one can add ‘non-cra’ type slips (eg. an Ironworkers Union Dues annual receipt). Also best to (on completion of forms) view all listed T- slips as, i found several were created, but were blanks, and needed to be deleted, before the netfile is created….Way easier than StudioTax…novice computer guy needs things easy..to build confidence with the magic box. Cheers.